You can arrange for catering yourself from nearby restaurants. You can tell us what you want and we will make the arrangements for you and handle the payments (different caterers have different rules), then we will charge you at our cost plus 20%. 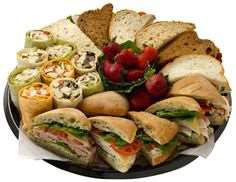 You can choose one of the quick catering options from our menus, at the published prices(no surcharge). Can I start early? Run late? Any part of a reservation outside of normal business hours carries a 25% surcharge. Meetings that run overtime are charged accordingly: 15 minutes grace, then a full hour for the first hour over or fraction thereof, then time-and-a-half for the second and subsequent hours over or fraction thereof. Basis is the reserved time. Your reservation must include and account for setup time as needed (we can help you estimate). We require ½ hour open time between meetings for cleaning and preparation. What’s included and what’s extra charge ? Reliable, secure broadband Internet service. Flat-screen monitor or hi-definition projector. Access to supplies and commercial grade office equipment, to keep you working productively. The Catalyst Conference Room can be configured for classroom teaching, team training, or other uses.The room comfortably supports 20 in a classroom style setup, or 30 in theater style. The Catalyst’s projection system accommodates up to 50 devices simultaneously, allowing up to four simultaneous displays. Combined with our teleconferencing/ videoconferencing services and you can hold a virtual meeting anywhere at any time. To make a big impression and seal the deal? The Enclave Boardroom features a solid mahogany boardroom table that seats ten participants comfortably. 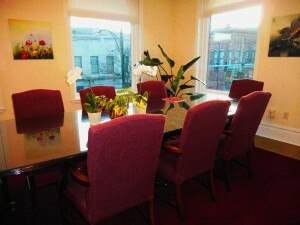 Equipped with an LCD TV, teleconferencing phone, and connecting doors to two offices for breakouts, it is ideal for depositions, signings, staff retreats, board meetings,or sales presentations. Our RainMakermeeting room seats six. You can spread out your work on the table, brainstorm your next great product or conduct small groupsessions. The room is equipped with a desktop printer/copier, speakerphone, and LCD monitor. Casual, open space for events such as receptions or networking sessions? Our WorkCafé™ is the perfect setting, and includes access to our kitchen/beverage station, plentiful seating, and floor-to-ceiling views of Corning’s Centerway Square and Riverfront Centennial Park. For smaller meetings of two to four people, the enclosed offices are an excellent solution. Videoconferencing is available in all rooms for an additional fee. Reserved offices are available for breakout sessions for an additional fee. *Subject to availability. 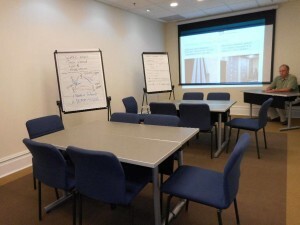 Centerway Executive Center meeting rooms provide productive space to you when you need it. Whether you're meeting with customers, giving a presentation, having an executive off-site or board meeting, or catching up with colleagues long-distance, we have flexible meeting spaces and conference facilities to suit. In conjunction with our Cloud Touchdown and DavinciMeeting Rooms networks, there’s always one of the hundreds of meeting rooms in our network within driving distance in most principal cities nationwide and many worldwide . We have rooms that are great for everything from one-to-one interviews to multi-site corporate videoconferences, ready to serve you. Our fully-furnished offices have the comfort and privacy perfect for your personnel interviews and meetings.They are well-lit,quiet and spacious so that you can focus on the important business of the moment. The Catalyst Conference Room can be configured for classroom teaching, team training, or other uses.The room comfortably supports 20 in a classroom style setup, or 30 in theater style. The Catalyst’s projection system accommodates up to 50 devices simultaneously, allowing up to four simultaneous displays.Combined with our teleconferencing/ videoconferencing services and you can hold a virtual meeting anywhere at any time. Plus telephone, speakerphone, secure videoconferencing, and catering services are all readily available. Book your meeting now using the online booking form, or talk to an advisor at +1-607-438-1123. We help you stay efficient and cost effective by accepting bookings for as short as one hour.